WASHINGTON — Facing mounting pressure to bring industrial competition to a congressionally mandated heavy-lift rocket development program, NASA has tentatively selected a vehicle design featuring solid-fueled, side-mounted boosters that eventually could be replaced with liquid-fueled engines, according to U.S. industry and congressional sources. NASA Administrator Charles Bolden has approved a design for the Space Launch System (SLS) whose core and upper stages would utilize space shuttle- and Apollo-heritage propulsion systems, respectively, these sources said. For the side-mounted boosters, NASA would continue development of shuttle-derived solid-rocket motors while initiating work on a brand new engine likely fueled by liquid kerosene, sources said. Among the companies that have expressed interested in developing an advanced kerosene-fueled engine are Aerojet of Sacramento, Calif., Space Exploration Technologies (SpaceX) of Hawthorne, Calif., and Pratt & Whitney Rocketdyne of Canoga Park, Calif. This engine might eventually replace the solid-fueled motors on SLS, sources said. NASA’s plan would appear to address conflicting pressures the agency is facing on the SLS program. The NASA Authorization Act of 2010, signed by U.S. President Barack Obama in October, directs the agency to utilize shuttle infrastructure and Constellation technology and contracts to the maximum practical extent in developing the SLS, which would be used for astronaut missions to deep-space destinations. But in recent weeks, some lawmakers have urged NASA to solicit competitive bids for the propulsion elements of SLS. Most recently, Sen. Richard Shelby (R-Ala.) called on the agency to hold a competition for the heavy-lifter’s side-mounted boosters. "I strongly encourage you to initiate a competition for the Space Launch System booster," Shelby wrote in a June 10 letter to Bolden. In the letter, Shelby, a fierce advocate for NASA’s Marshall Space Flight Center in Huntsville, Ala., which specializes in propulsion, questioned whether using the shuttle-derived boosters is the most cost-effective approach to SLS. “Designing a Space Launch System for heavy lift that relies on existing Shuttle boosters ties NASA, once again, to the high fixed cost associated with segmented solids,” Shelby wrote. Shelby’s missive follows a May 27 letter to Bolden from Sens. Barbara Boxer (D-Calif.) and Dianne Feinstein (D-Calif.) that also pressed for a competitive SLS propulsion procurement. The NASA Authorization Act of 2010 directs the agency to field an SLS vehicle capable of placing 130 metric tons into low Earth orbit by 2016. In terms of capability the vehicle ordered up by Congress closely resembles the Ares 5 rocket designed by NASA as part of Constellation, a collection of hardware development efforts intended to replace the retiring space shuttle and eventually deliver astronauts to the surface of the Moon. Obama proposed canceling Constellation in his 2011 budget request, and NASA officially pulled the plug on the program June 10. 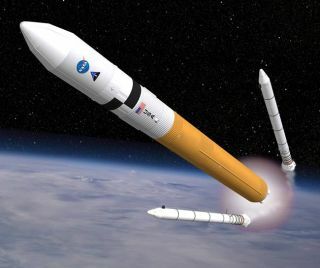 Since the law's enactment, NASA has provided Congress with SLS reference designs that also closely resemble the Ares 5, but at the same time warned that the vehicle could not be fielded on the designated schedule under current budget scenarios. Industry sources privately questioned the affordability of NASA’s latest strategy, given that it adds a brand new engine development program to the mix. Some also have suggested that competition will slow the SLS development effort. Shelby disagrees. He wrote that he has "seen no evidence that foregoing competition for the booster system will speed development of SLS or, conversely, that introducing competition will slow the program down." Shelby also said the SLS language in the authorization act gives NASA sufficient leeway to hold a competition. "It was never our intention to foreclose the possibility of utilizing competition, where appropriate," Shelby wrote. Utilization of Constellation contracts and technology, he said, quoting the law, was required "only 'to the extent practicable.'" Aerojet, which has been perhaps the most outspoken proponent of open competition for SLS propulsion elements, was encouraged that NASA appears to be leaning in that direction. Aerojet recently formed an alliance with Teledyne Brown Engineering of Huntsville, Ala., to pursue NASA propulsion opportunities. "Aerojet has encouraged competition since early on," said Glenn Mahone, a company spokesman. "We are ready to compete against any company that’s out there and are hopeful that the acquisition NASA puts forward will be objective and equitable." Mahone specifically declined comment on the possibility of having to compete with a new engine design against a well-developed solid-rocket propulsion system with 30 years of flight heritage. He also declined to say whether Aerojet has developed engine designs applicable to the SLS side-mounted boosters. Lawmakers appropriated $1.8 billion in 2011 for the SLS, and NASA, which has been accused of dragging its feet on the program, said June 14 it has released approximately $1.4 billion of that total. The reference SLS design approved by Bolden would have a core stage powered by the hydrogen-fueled main engines used today on the space shuttle, which is being retired after its next mission, now scheduled to begin July 8. Those engines were manufactured by Pratt & Whitney Rocketdyne. The upper stage of the heavy-lifter would utilize the J-2X, a modified version of the Apollo-heritage J-2 engine also being developed by Pratt & Whitney. The J-2X and the modified space shuttle solid rocket motors being developed by ATK were key elements of the now-defunct Ares 1, which under Constellation was to launch a crew-carrying capsule into space. Both the J-2X and the modified solid rocket booster — featuring five segments rather than four used on the shuttle boosters — were key building blocks for the much-more-powerful Ares 5. One of NASA’s biggest concerns as it seeks to comply with congressional direction to take advantage of existing contracts in developing the SLS is doing so in a way that does not draw a protest from companies that would be left out in the process.